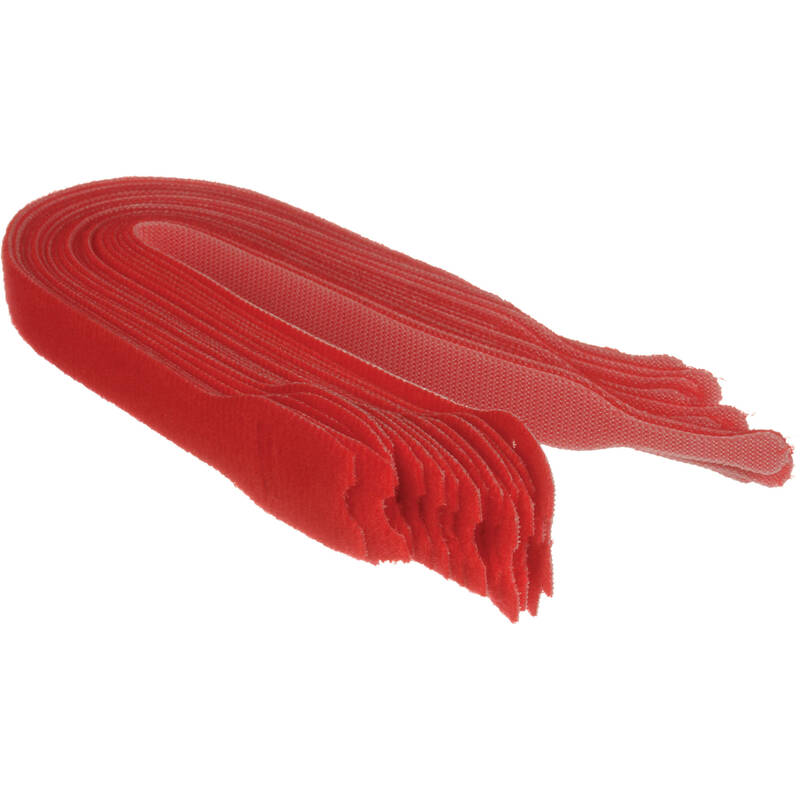 This 20-pack of red Kino Flo 12" Ballast/Cable Tie Wraps allow you to organize and contain unruly cables when stored or in use. Box Dimensions (LxWxH) 8.5 x 2.95 x 1.85"
12" Ballast/Cable Tie Wraps (20-Pack, Red) is rated 5.0 out of 5 by 19. Rated 5 out of 5 by Chris from Great Wraps I manage multiple sound systems belonging to the same organization and I use these wraps to color code our cables. That way it's easy to tell which cables belong to which system. They are nice and long so you can wrap larger cables without having to link them together like with other wraps. The velcro also has very short hooks which prevents these from picking up lint and other debris. Easy to wrap and unwrap. Rated 5 out of 5 by Midnine from Extremely helpful! This is a must for all grip pros. This little thing will help you in big ways to control cables or to just attach something around. This particular product is strong not industrial strong but strong enough to hold cable and tie loose ends. Best of all it does not leave a mess and can be reused. Rated 5 out of 5 by Mark Esper from Well thought-out Cable ties can be fiddly things and these are just right. Bright yellow for good visibility, they ties off completely without leaving any straggly ends or offshoots that might catch or distract on a lighting stand / rig. Rated 5 out of 5 by Kidfolio from The Perfect Accessory The perfect accessory to help keep your cords and cables organized. Also great for attaching small items (PocketWizards and such) to light stands. A must have for your equipment case! Rated 5 out of 5 by primitiveworld from Their Really Blue! They really are blue, but they really wrap things and work well, and do all you could ever ask of a tie wrap. Rated 5 out of 5 by Ryan A Randall from Pricey but worth it. I have tried a number of velcro cable wraps professional as well as in a University film & video sign out cage and the Kino Flo wraps can't be beat. With a large variety of colour for coding these wraps are robust and resilient. Rated 5 out of 5 by Robo from A must-have for cables It's things like these that set professionals apart from amateurs. Never having to worry about untangling cables is what professionals make a living off of. Pretty good bargain too and they work like a charm. Plus being velcro and looping through themselves on the cable, you'll never have to buy more unless you're 20+ on cables. The solid blue stands out well against black xlr cables. Rated 5 out of 5 by Anonymous from Easy to Spot in your Gear Bag These Fasteners, in red, were surprisingly cheaper than the Black ones and have plenty of uses! Having some of these around helps manage all the pesky charger cables, tether cables, light extension cords you end up with in your photography gear bag. I recommend grabbing the Red ones for the bag and not the black ones.